Railroads are booming! Stay one step ahead. 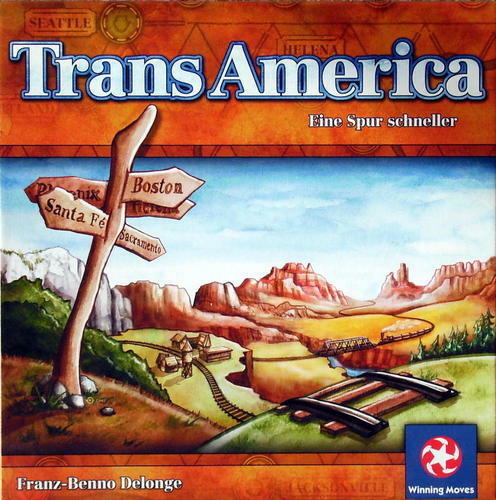 TransAmerica is a fast-paced-track-laying game. Each player tries to connect their five cities scattered across the United States with a network of tracks. Players may connect their networks to others and then use the connected networks as their own. As soon as a player has connected all of their cities the round ends. The other players lose points for unconnected routes thereby moving their scoring marker down the track towards zero. The game ends when at least one player’s locomotive score marker has reached zero points. The player with the least penalty points wins. Included in the edition is the Vexation Expansion that adds a whole new layer of strategy. The game follows the same rules as the basic game. However, in addition to shared railroad tracks, each player has 3 colored tracks that can be placed to block routes from being used by other players. 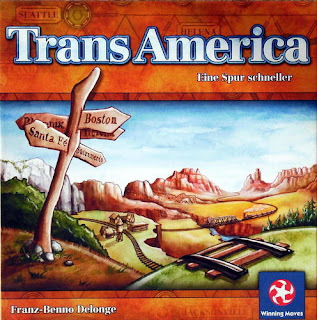 We have an open copy of TransAmerica available in our Demo Games Library for you come in and try.